Even before you have purchased a motorcycle, the best way you can learn about motorcycling is from the experts. Whether you are new to motorcycling or returning to an old passion, you will benefit from a motorcycle Rider Training course. And, yes, the motorcycle is supplied for the basic learner’s course. As well, as an added bonus, you may qualify for savings on your motorcycle insurance! 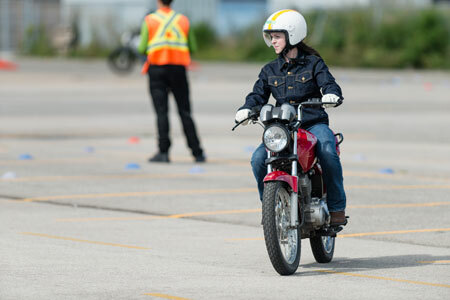 MMIC supports motorcycle rider training programs across Canada. The MMIC believes that rider training is one of the best ways, if not the best way, to learn how to ride a motorcycle. they use an approved curriculum. In most provinces, rider training can help you obtain your motorcycle license. These basic training programs are a comprehensive 18-hour experience to give you necessary motorcycle handling skills. They are conducted away from traffic on motorcycles that the course provides. They are geared toward personal coaching and a relaxed approach to put you at ease while also challenging you. The typical course is scheduled on a weekend or two week days. The weekend starts Thursday or Friday evening with a three-hour classroom discussion of risk factors and basic riding strategies.During the course you will ride a series of exercises that builds one skill after another until you have a sense of control and accomplishment. The program concludes on the afternoon of the second day with an on-site riding exercise to meet provincial ministry standards. If you are successful, the riding school is authorized by the ministry to issue you a certificate for your next level of motorcycle licence (in applicable provinces). For those motorcyclists who presently have your probationary licence and need to obtain your full motorcycle licence, or who want a higher comfort level in traffic, we recommend Advanced Training. This higher level training program qualifies you to obtain your full motorcycle licence in many provinces. Advanced training assumes that you have basic motorcycle handling skills in traffic. It fine-tunes your traffic observation and management practices on your own motorcycle in a real traffic environment. The training differs from province to province and usually involves a minimum of nine to fifteen hours. The ratio riders to each instructor is small and ranges around three or four to keep your learning intimate and relaxed. Typically, training will take place on Friday evening and either a Saturday or Sunday. This course is enjoyable for the camaraderie of group riding, and especially for the development of confidence in your skills. if you will enjoy yourself with instructors that are there exclusively to pass on to you their expertise and enthusiasm for the sport.